This example uses the Robust Control Toolbox™ commands ucover and dksyn to design a high-performance controller for a family of unstable plants. The nominal plant model consists of a first-order unstable system. The family of perturbed plants are variations of Pnom. All plants have a single unstable pole but the location of this pole varies across the family. For feedback design purposes, we need to replace this set of models with a single uncertain plant model whose range of behaviors includes p1 through p6. This is one use of the command ucover. This command takes an array of LTI models Parray and a nominal model Pnom and models the difference Parray-Pnom as multiplicative uncertainty in the system dynamics. Because ucover expects an array of models, use the stack command to gather the plant models p1 through p6 into one array. The resulting model P is a single-input, single-output uncertain state-space (USS) object with nominal value Pnom. Uncertain continuous-time state-space model with 1 outputs, 1 inputs, 5 states. A Bode magnitude plot confirms that the shaping filter Wt "covers" the relative variation in plant behavior. As a function of frequency, the uncertainty level is 30% at 5 rad/sec (-10dB = 0.3) , 50% at 10 rad/sec, and 100% beyond 29 rad/sec. To design a robust controller for the uncertain plant model P, we choose a desired closed-loop bandwidth and minimize the sensitivity to disturbances at the plant output. The control structure is shown below. The signals d and n are the load disturbance and measurement noise. The controller uses a noisy measurement of the plant output y to generate the control signal u. 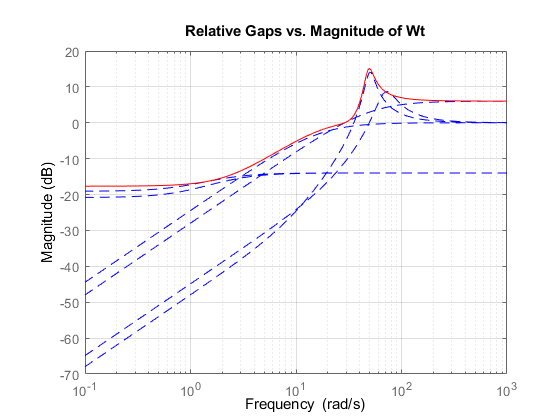 By choosing appropriate magnitude profiles for Wperf and Wnoise, we can enforce small sensitivity (S) inside the bandwidth and adequate roll-off (T) outside the bandwidth. 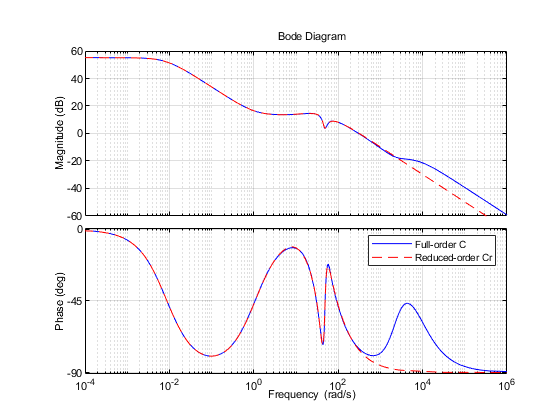 Similarly, pick Wnoise as a second-order high-pass filter with a magnitude of 1 at 10*desBW. This will force the open-loop gain PC to roll-off with a slope of -2 for frequencies beyond 10*desBW. 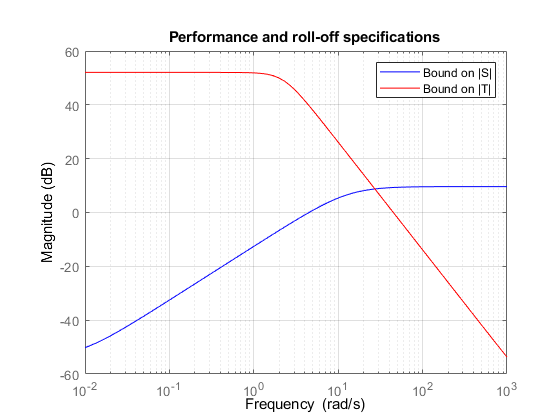 Verify that the bounds 1/Wperf and 1/Wnoise on S and T do enforce the desired bandwidth and roll-off. G is a 3-input, 2-output uncertain system suitable for robust controller synthesis with dksyn. The design is carried out with the automated robust design command dksyn. The target bandwidth is 4.5 rad/s. When the robust performance indicator muPerf is near 1, the controller achieves the target closed-loop bandwidth and roll-off. As a rule of thumb, if muPerf is less than 0.85, then the performance can be improved upon, and if muPerf is greater than 1.2, then the desired closed-loop bandwidth is not achievable for the specified plant uncertainty. State-space model with 1 outputs, 1 inputs, and 18 states. You can use the reduce and dksynperf commands to simplify this controller. Compute approximations of orders 1 through 17. For each reduced-order controller, use dksynperf to compute the robust performance indicator and compare it with muPerf. Keep the lowest-order controller with performance no worse than 1.05 * muPerf, a performance degradation of 5% or less. This yields a 6th-order controller Cr with comparable performance. 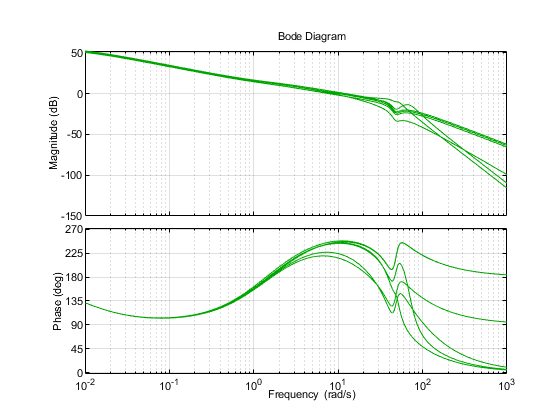 Compare Cr with the full-order controller C.
Plot the open-loop responses of the plant models p1 through p6 with the simplified controller Cr. 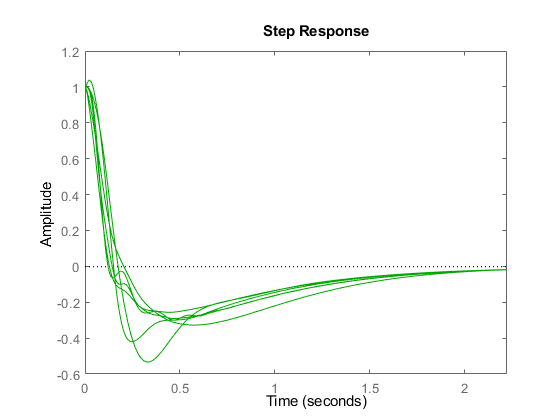 Plot the responses to a step disturbance at the plant output. These are consistent with the desired closed-loop bandwidth and robust to the plant variations, as expected from a Robust Performance mu-value of approximately 1. Using desBW = 8 yields a good design with robust performance muPerf of 1.09. The step responses across the Parray family are consistent with a closed-loop bandwidth of 8 rad/s. Using desBW = 20 yields a poor design with robust performance muPerf of 1.35. This is expected because this target bandwidth is in the vicinity of very large plant uncertainty. Some of the step responses for the plants p1,...,p6 are actually unstable. Using desBW = 0.3 yields a poor design with robust performance muPerf of 2.2. This is expected because Wnoise imposes roll-off past 3 rad/s, which is too close to the natural frequency of the unstable pole (2 rad/s). In other words, proper control of the unstable dynamics requires a higher bandwidth than specified.